Born in South Carolina on 9 August 1809, William Barret Travis will always be remembered as the Texas commander at the Battle of the Alamo. He spent his childhood in Saluda Co., SC, which was also the home of James Butler Bonham, another Alamo defender. Travis studied law and became a practicing attorney for a brief time before marrying Rosanna Cato at the age of nineteen. Within a year, when Travis was barely twenty years old, they had a son, Charles Edward Travis. Remaining in the area, Travis began publication of a newspaper, became a Mason, and joined the militia. The marriage soon failed, however. Travis abandoned his wife, son, and an unborn daughter, and headed for Texas. After arriving in Texas in early 1831, Travis obtained land from Stephen F. Austin. He set up to practice law first in the town of Anahuac, and afterwards at San Felipe. 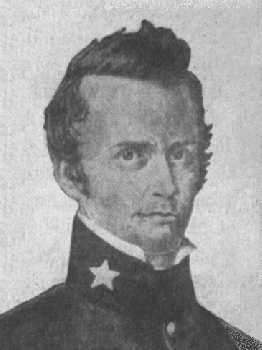 When friction developed between Texas and Mexico, Travis was one of the first to join the Texas forces. When Mexican General Martin Perfecto de Cos demanded the surrender of the Texan's cannon that resulted in the Battle of Gonzales, Travis was one of hundreds to come to the its defense. He arrived too late, however, to take part in the action. On orders from Provisional Governor Henry Smith in January of 1836, Travis entered the Alamo with about 30 men. Within a few days, he found himself in command, when then commander James C. Neill took leave to care for his family. Travis commanded the Texas defenders during the Siege and Battle of the Alamo. His Appeal from the Alamo for reinforcements has become an American symbol of unyielding courage and heroism. Although a few reinforcements arrived before the Alamo fell, Travis and over 180 defenders gave their lives for Texas independence on 6 March 1836. Remarkably, Travis was only twenty-six years of age at the time of his death.